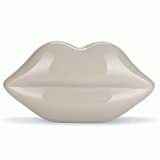 Make a statement with the stunning Lulu Guinness Stone Perspex Lips Women’s Clutch Bag. This iconic design is favoured by celebrities and is the perfect finishing touch to any party outfit! The unique lips clutch bag is made from a delicate ceramic, glass like material so be extra careful with it. The bag is fastened by a magnetic clasp – ideal for an eye catching look this season.